I spent the weekend in the mountains (which is why there was no usual weekend post). Sean took me to Jasper National Park as a congratulations gift for passing the UFE (giant, horrible accounting exam) in December (we couldn’t get away until now). We stayed at the Overlander Mountain Lodge. It was our second time staying at this hotel and we absolutely love it. The view from our hotel room was gorgeous! 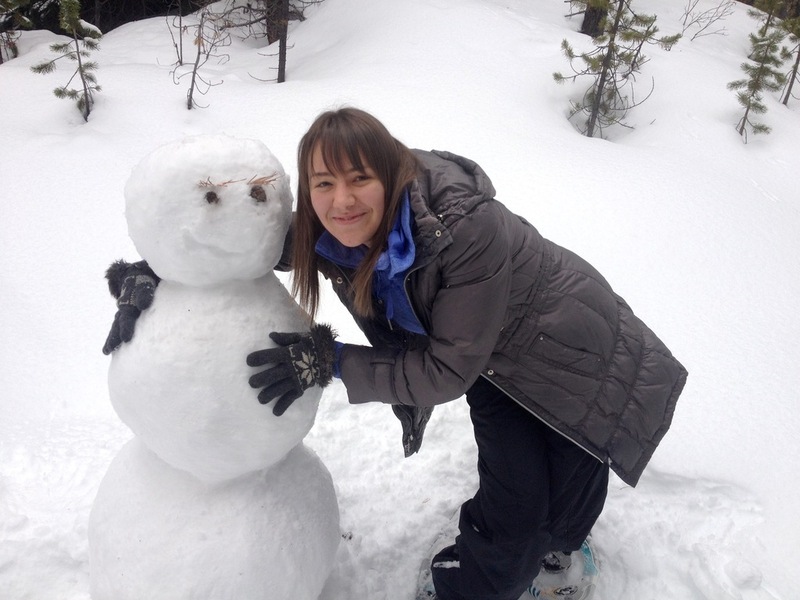 We spent the weekend snow-shoeing, building snowmen and just relaxing. Ok now let’s talk food. First of all we had several great dinners (which I will probably blog about later). 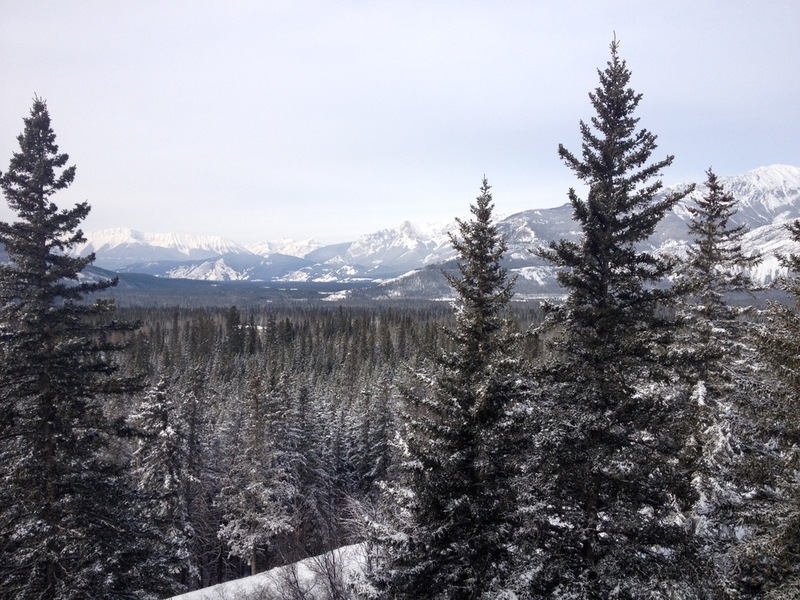 Second of all… what goes better with snow shoeing and hiking in the mountains than granola! 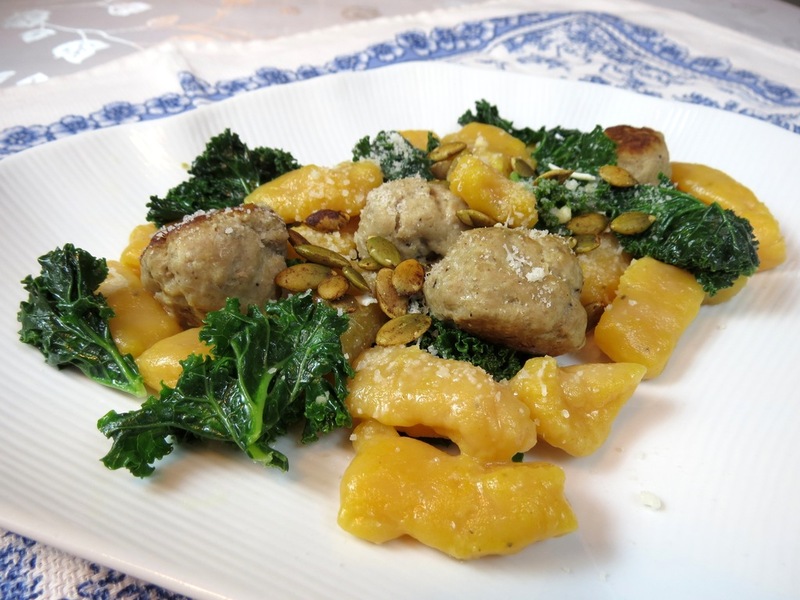 This is another recipe from Oh She Glows. I feel like I’ve been obsessed with her blog lately. 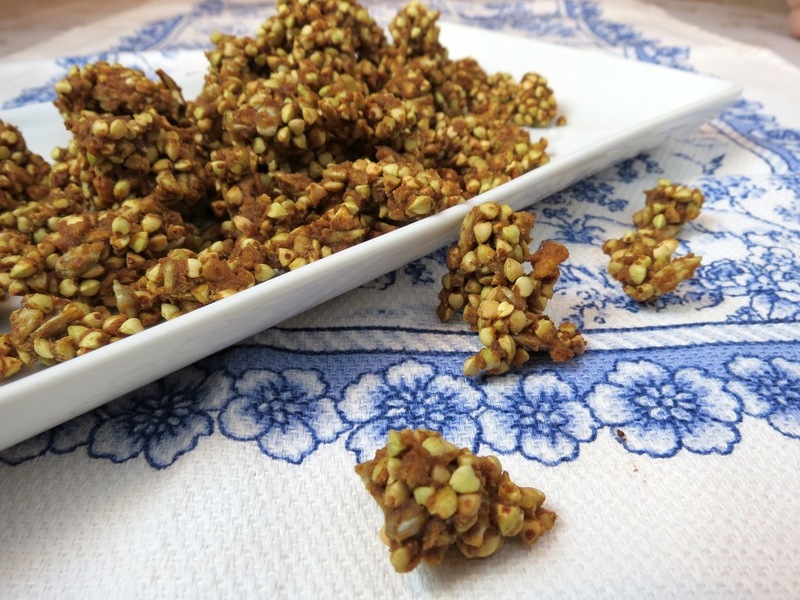 Everything is easy to make, healthy and delicious… just like this buckwheat granola. 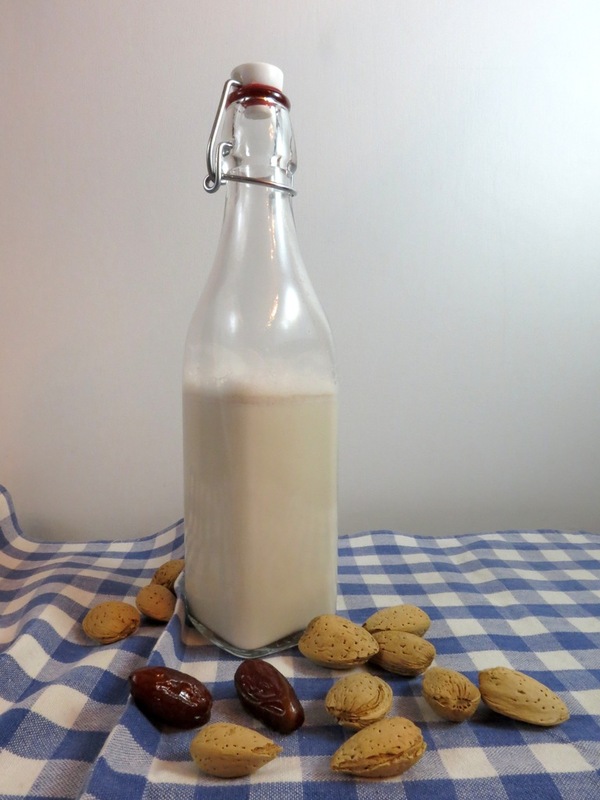 The granola is made without oats and with buckwheat instead. Ok, right off the bat I have to tell you guys that I used to hate buckwheat as a kid, so I was skeptical. However, I only recently found out that raw buckwheat groats are different from buckwheat kasha (which is toasted and has a strong, nutty taste). I realized that buckwheat kasha is what I really don’t like. 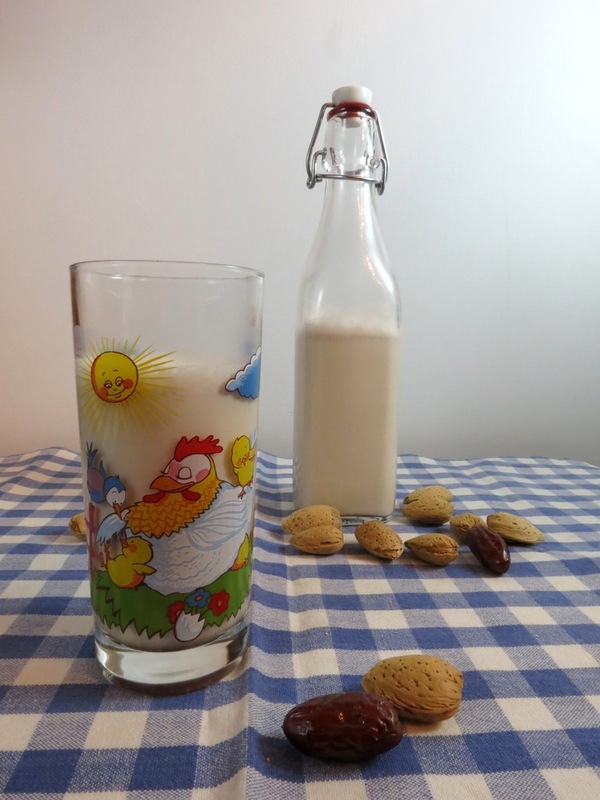 The raw groats are actually quite pleasant and made a delicious granola. I love that this granola uses almond pulp, leftover from making almond milk. 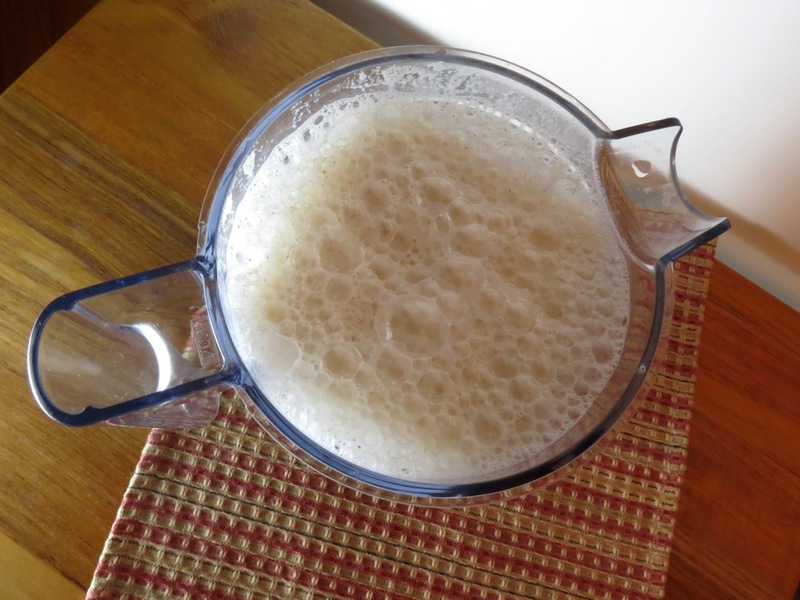 I used home-made applesauce in mine as well as honey to sweeten (instead of coconut nectar). I also used coconut sugar. This was my first time using it and I loved it. 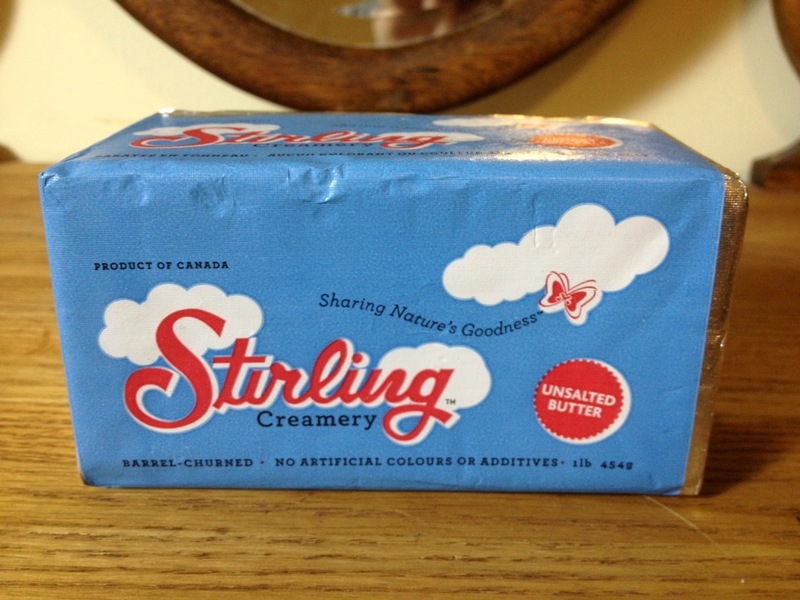 It had a great, caramel-like flavour to it and was less sweet than granulated sugar. I feel like I burnt myself out a little this past weekend. Having been out of town for a while, I felt deprived of home cooked meals and may have overcompensated for it by cooking up a storm this weekend. All in all, I was still trying to finish up in the kitchen at 10:30pm on Sunday night. 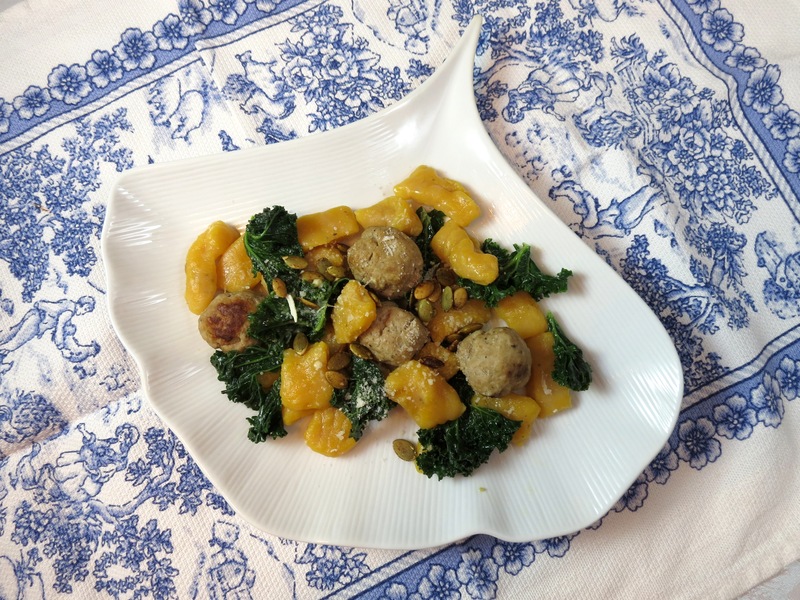 Some of the things I made: home made butternut squash gnocchi with pork meatballs and kale, 3 batches of almond milk, buckwheat granola (so good!) 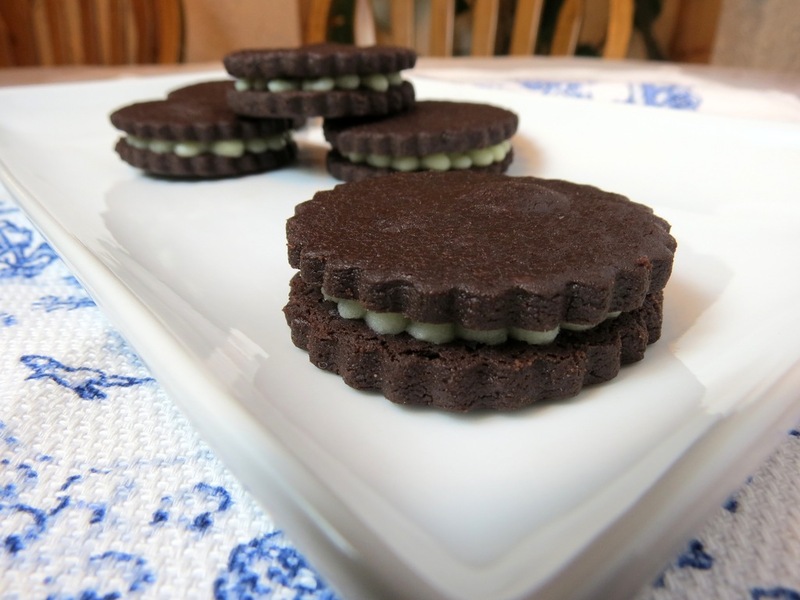 and these cute little home made Oreo cookies! The cookie recipe came from my recently acquired Bouchon Bakery book. 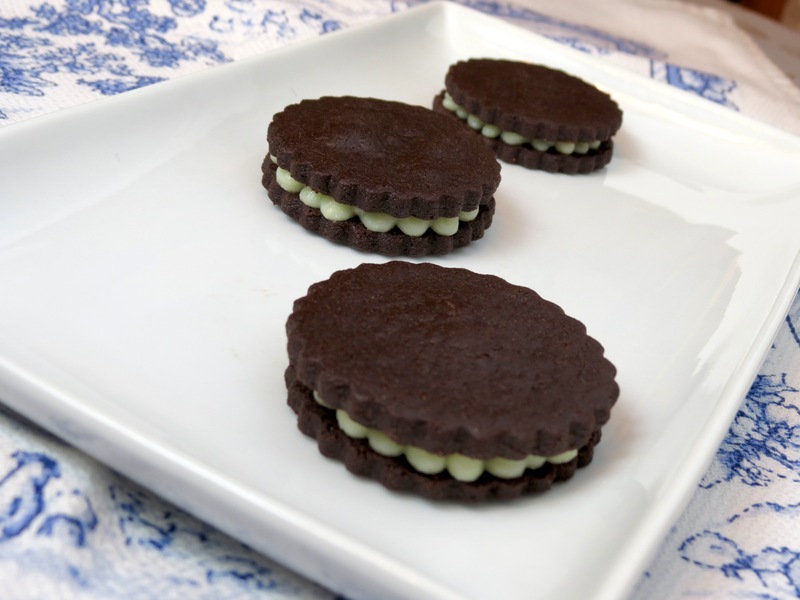 The cookies are essentially chocolate shortbread with a white chocolate ganache filling. They are a bazillion times better than store bought Oreos (but I may be biased since I don’t like store bought ones to begin with). I think the success of these cookies comes from using really good quality cocoa. 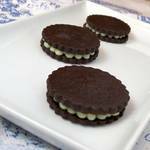 I used Valrhona cocoa which I purchased from Provisions by Duchess in Edmonton. The result was a very rich chocolate taste – definitely worth using a fancier cocoa. 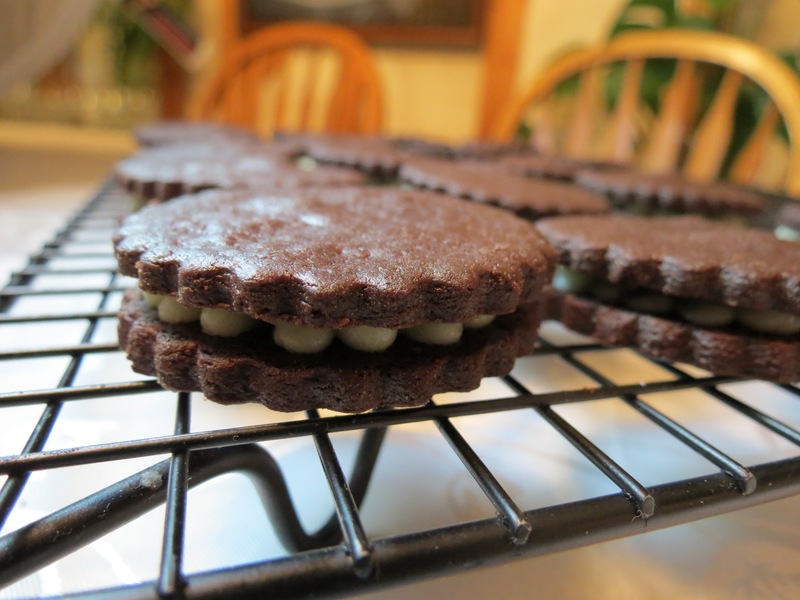 The recipe talks about using Guittard Cocoa Noir which makes a really dark, almost black cookie. Since I didn’t have this cocoa and wasn’t overly concerned with the colour of my Oreos, I opted out of searching for the Cocoa Noir. Either way, I think my batch turned out dark and pretty. Before you guys jump right into making these cookies… a word of warning. This isn’t a recipe where you just combine everything in a bowl and throw it in the oven. I found the dough was very sensitive to temperature changes and I was constantly chilling the dough, having it warm up too much and become too soft, chilling again, etc. etc. 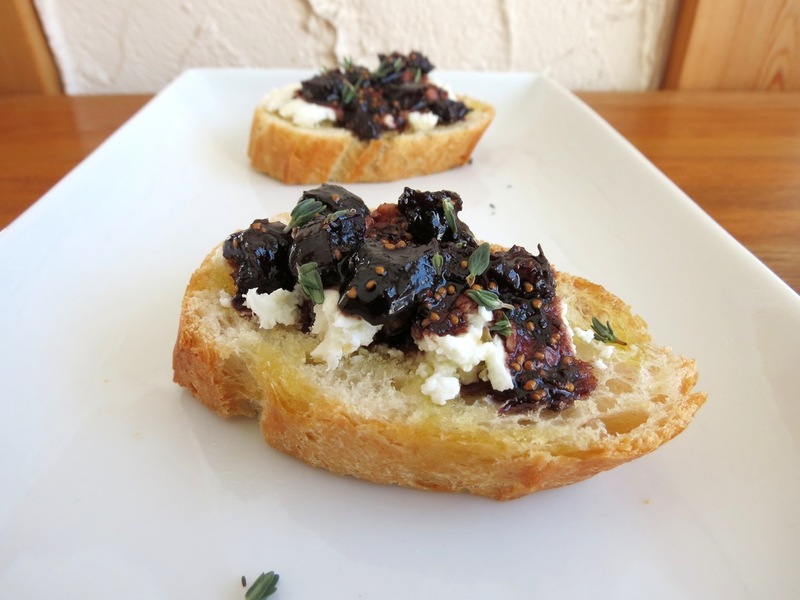 So be prepared to spend some time running back and forth from the fridge or freezer. Same thing goes for the ganache filling – I found that it was a bit difficult to work with, would warm up in the piping bag in my hands and become too runny very quickly. 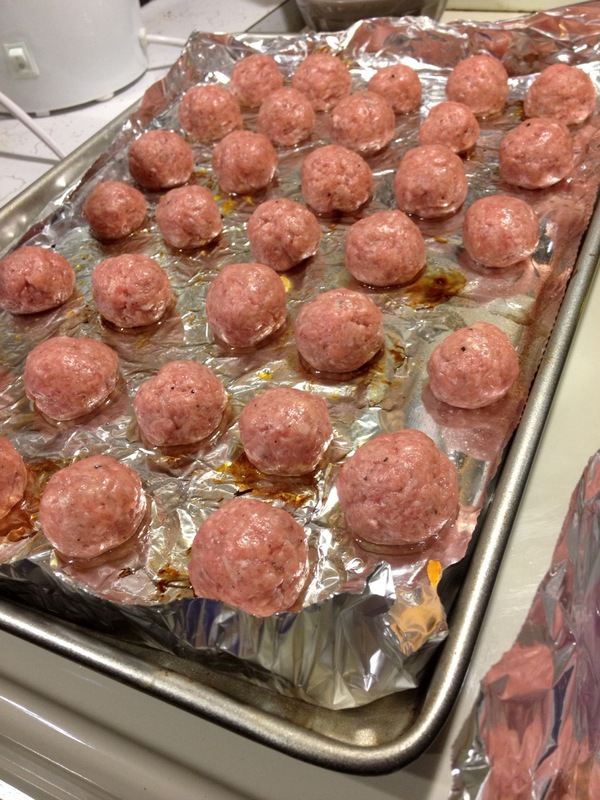 I tried to work in small batches and keep the filling from overheating. Also, I know that salt brings out the other flavours in baking, but I found the salt content a bit too high for my taste in these cookies so the recipe I’ve posted has been adjusted a bit. 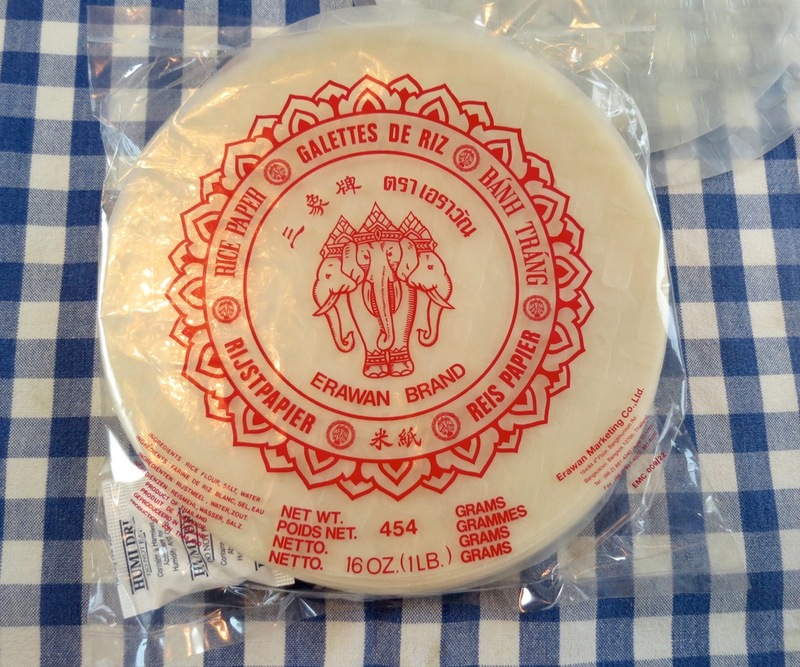 The ingredients in the recipe are listed in very specific gram amounts… like 161 grams. I really believe that using your kitchen scale to accurately measure ingredients makes a huge difference in your final product. And the Bouchon Bakery book has a whole section on the merits of measuring ingredients – if the professionals say its worthwhile… it must be true However, since some kitchen scales (such as my own) can’t accurately measure very small weights, I have provided the approximate volumes for a few of the really small weights below. 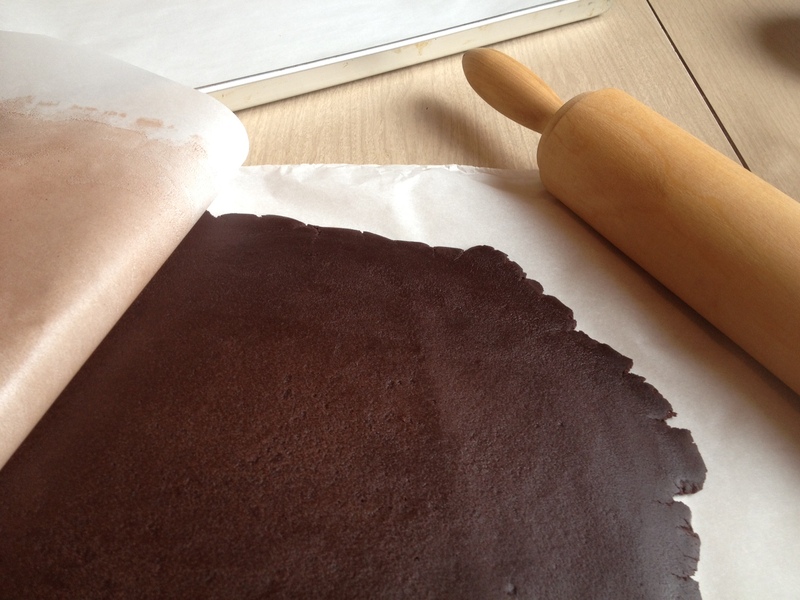 Begin by making the ganache filling. Melt the white chocolate and 15 grams of butter together over low heat. Meanwhile bring the whipping cream to a simmer. Once the chocolate is melted and smooth, remove from heat and add the whipping cream. Mix until smooth. If there are any lumps, return to very low heat and mix until smooth. Cover and chill the ganache for a minimum of 4 hours. Next, start the shortbread. 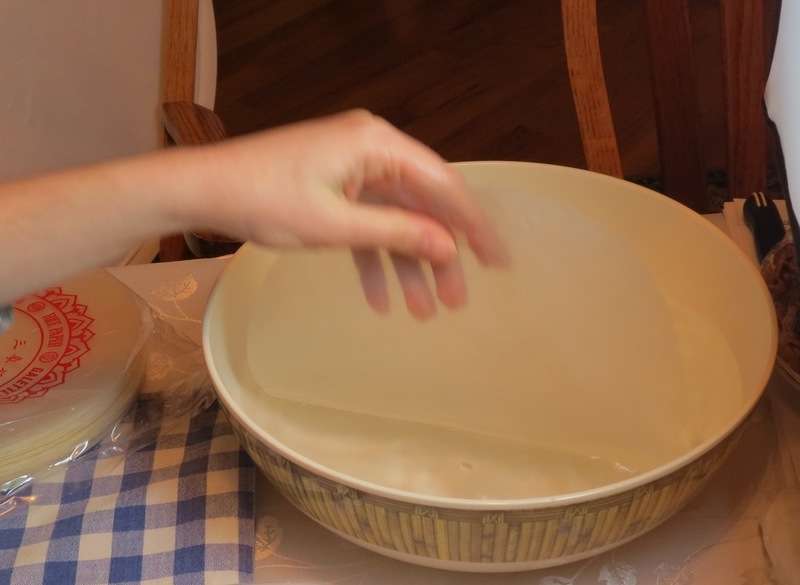 Measure out the flour into a bowl. Sift in the cocoa and baking soda. Place the 227 grams butter into the bowl of an electric mixer and beat on medium-low speed with a paddle attachment until smooth. Add in the salt and mix for a few seconds. Add in granulated sugar and beat until fluffy. Add the cocoa mixture to the butter mixture in two additions. Mix on low speed after each addition until fully combined. 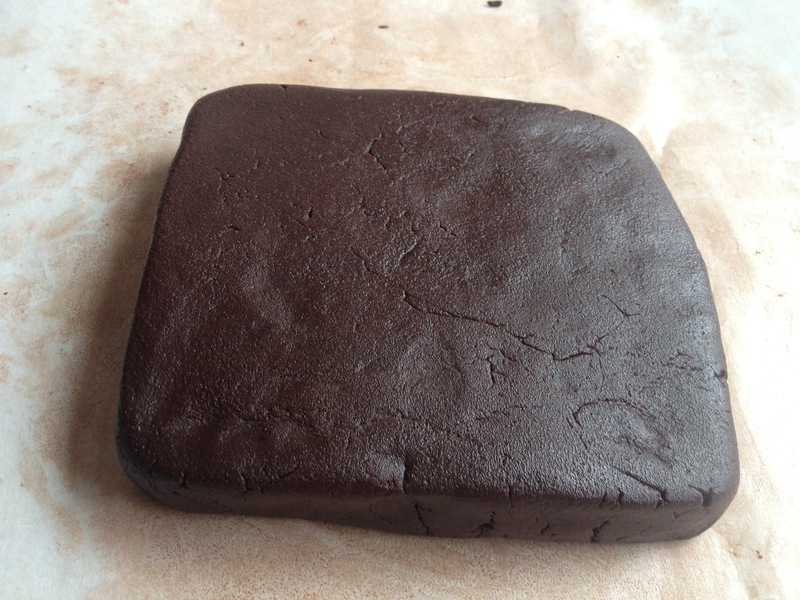 Once the dough starts to come together, stop the mixer and shape the dough into two square discs. Chill until firm - about 1 hours. Once the dough is chilled, preheat oven to 325F. Doll out the disc of dough between two sheets of parchment until it is about 1/8" thick. At this point, the dough will likely have softened. 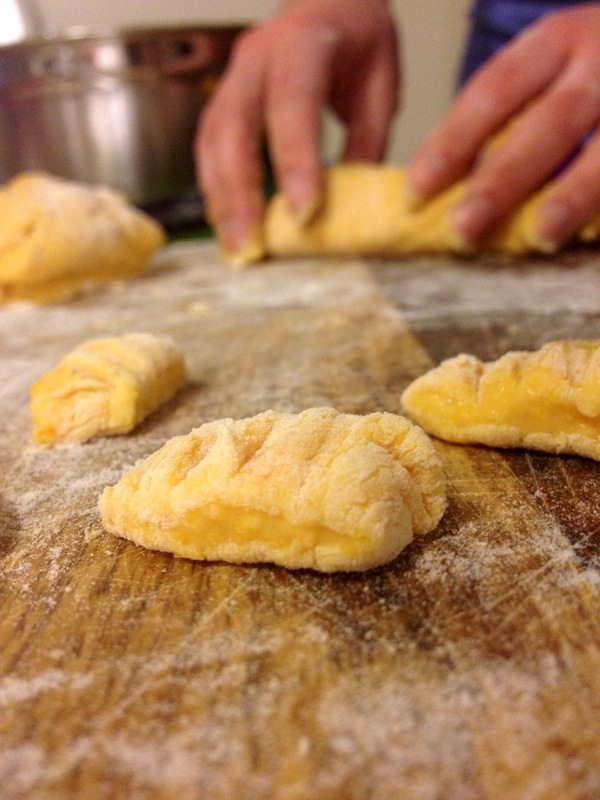 Return the rolled dough to fridge. Once chilled, use a round or fluted cutter of your choice to cut out cookies. Place the cookies on a parchment-lined tray, leaving about 3/4" between cookies. Chill the tray once again before baking for 15 minutes or until cookies are firm. Bake for 15-17 minutes, rotating the trays midway. The cookies will be done when they are fragrant and small cracks appear on the surface. Once the cookies are fully cooled, transfer ganache to the bowl of an electric mixer and mix with a paddle attachment until the mixture is smooth and thickens. 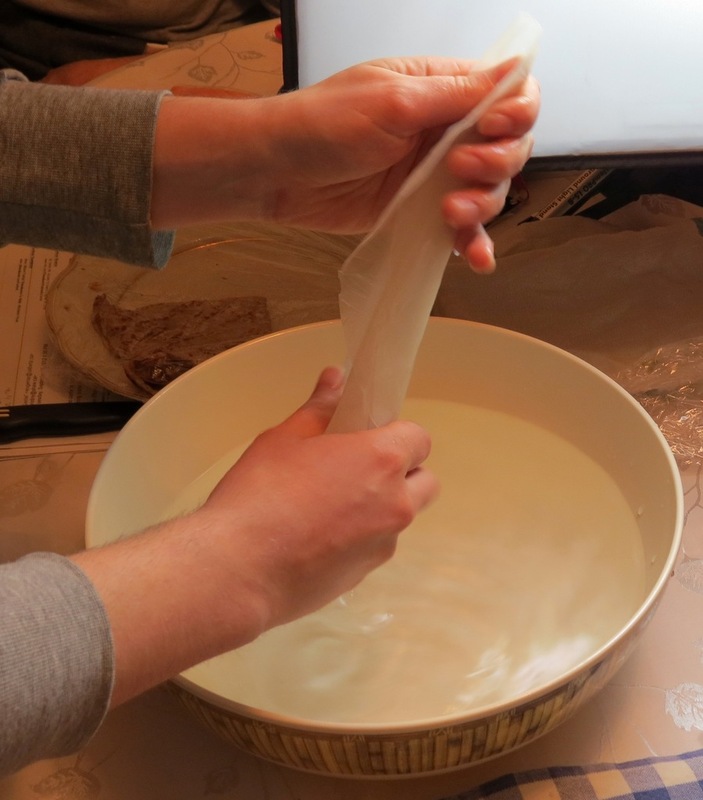 Transfer ganache to a pastry bag. Pipe filling onto the half the cookies. 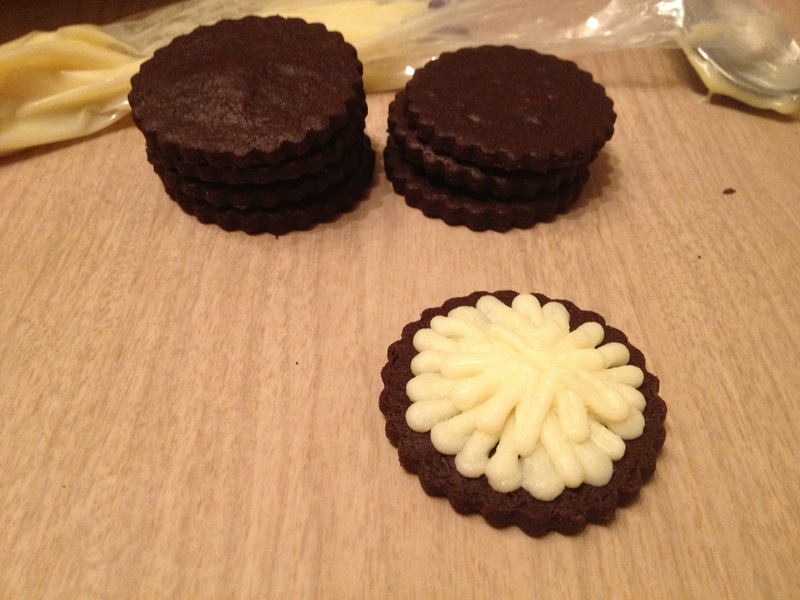 Use another cookie to place on top of the filling. Press down slightly to create a sandwich. Enjoy your cookies! 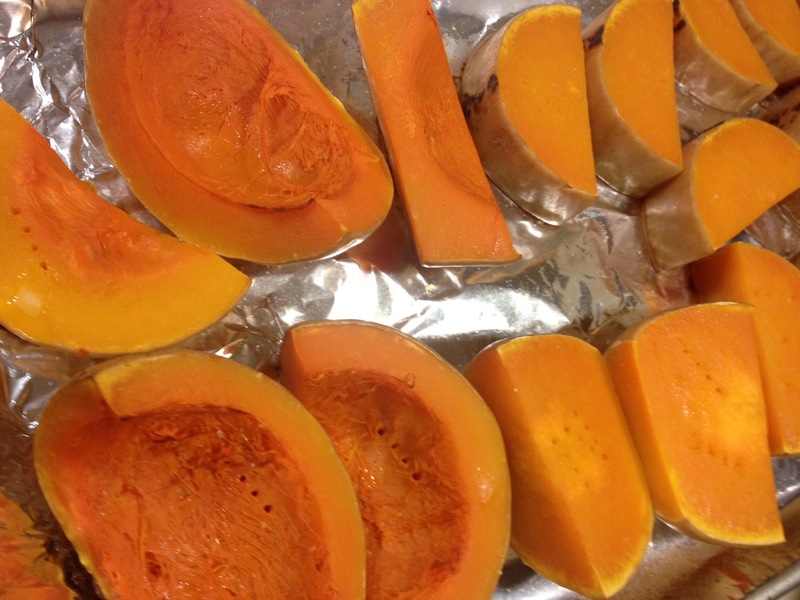 They can be stored for up to 3 days in the fridge and are delicious dipped in (almond) milk. 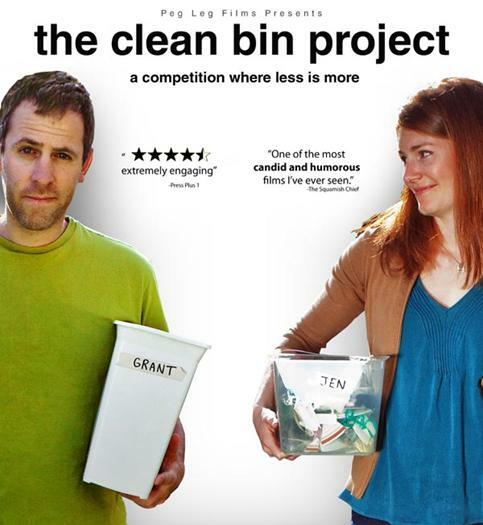 Looking for a Good Documentary? I am officially back from Lloyminster and looking forward to hopefully getting some baking and cooking in this upcoming weekend. Today I wanted to share my thoughts on something unrelated to baking: a few documentaries I got to watch at the Global Visions Film Festival this past weekend. Ping Pong is a movie about 8 players (aged between 80 and 100 years old!) who compete in the 80+ world championships for ping pong. This film was entertaining from beginning to end. I was so drawn into each player’s story and wanted each one of them to take first place. The film did a great job of exploring the challenges of getting older, persevering through these challenges and making the most of the time we have. Each player was truly inspirational: from Les who can lift a gigantic bar bell with impossible ease to Lisa who is the sassiest senior I’ve ever seen. At the same time, the film was also very touching and left me holding back tears several times. Overall, Ping Pong is definitely a well-done film that is worth watching. 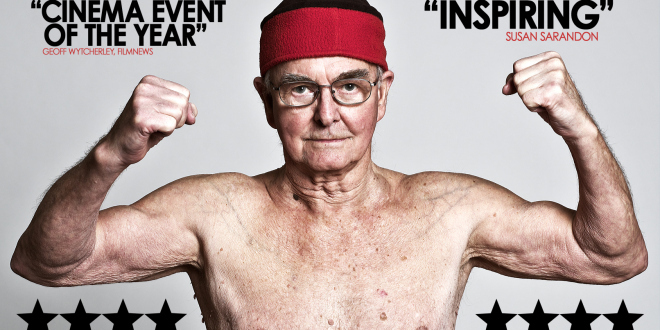 And, needless to say, I hope I’m like these awesome seniors when I reach that age! 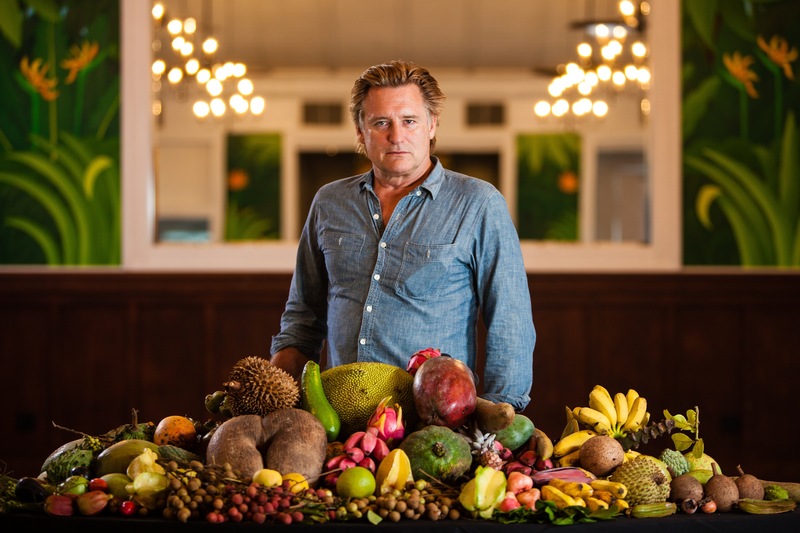 Fruit Hunters is a film about… well… fruit! And about those who are fascinated and even obsessed with it. I was initially drawn to this film because of the unusual subject and figured it would be either hit or miss. While there were a few slower and cheesy parts in the movie, overall, I was pleasantly surprised. The film follows several groups of people: fruit growers, fruit connoisseurs and those looking to find and preserve rare species. It definitely makes you reflect on our relationship with food and nature. So many different fruits were looked at from the well-known Cavendish banana to exotic species like miracle berry fruit, citrus caviar and ice cream bean. By the end of the film, I wanted not only to try as many new types of fruit as I could, but also to go on a fruit-hunter adventure of my own. I came away from the film a little bit saddened by how many fruit species we have lost or are currently at risk of losing if they aren’t preserved in time. I’m sure you’ve all heard of carbon credit programs which have been established in an attempt to reduce carbon emmissions. Essentially, companies are allowed to emit a certain amount of pollution. If they participate in a United Nations approved program to reduce pollution in another part of the world, they are given offsetting carbon credits which allow them to emit more pollution, creating a financial incentive for the companies. 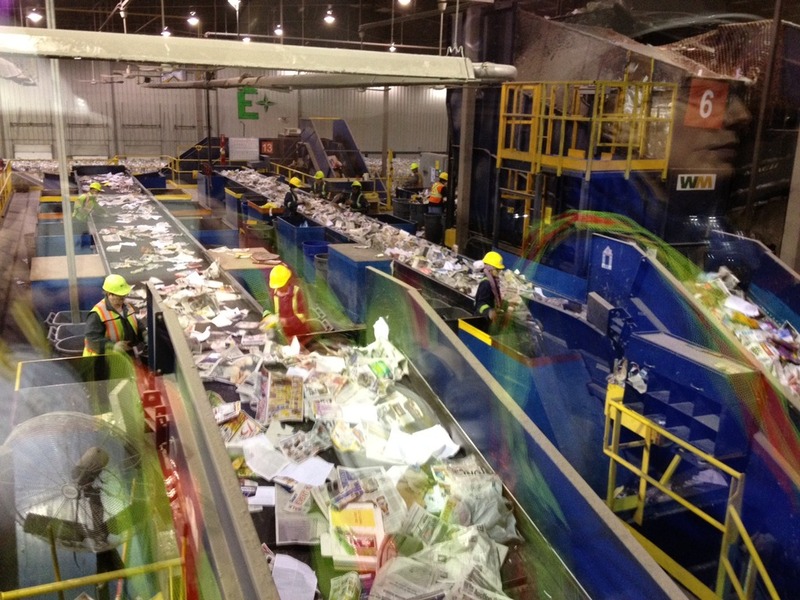 Carbon Rush explores how these programs are impacting communities in lower income countries. I was horrified to hear personal accounts of the atrocious impact that these programs are having on communities internationally. Entire towns find themselves struggling to survive. Communities are being taken advantage of, their livelihoods are taken away and water sources or farmland are being compromised and completely restricted. It was difficult to see the pain in these victims’ lives. It was also difficult to comprehend that these programs are marketed to appear as aiding the environment and planet in North America while they are creating such hardships for people across the globe. The programs help make more $$’s for big companies and it’s even questionable if the programs even succeed in reducing carbon emissions in the first place. The film left me feeling somewhat overwhelmed and hopeless. However, the first step towards change is raising greater awareness. 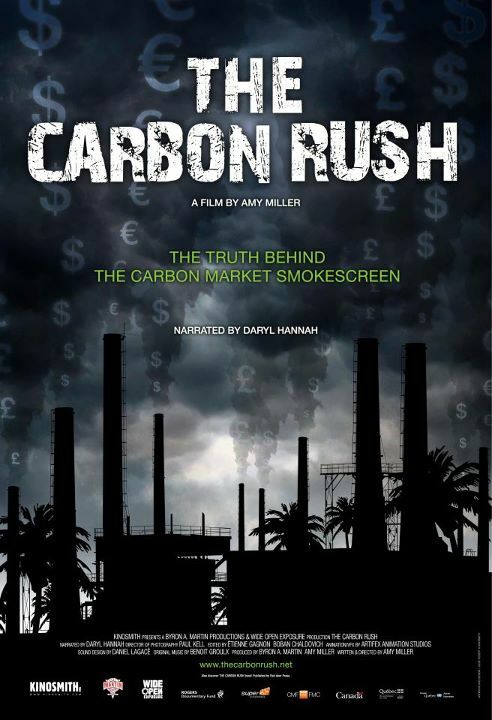 I think Carbon Rush is definitely worth watching and encourage everyone to share its message. Maybe if consumers know the truth behind carbon credit programs, we won’t be fooled into thinking that we should support companies that participate in them. 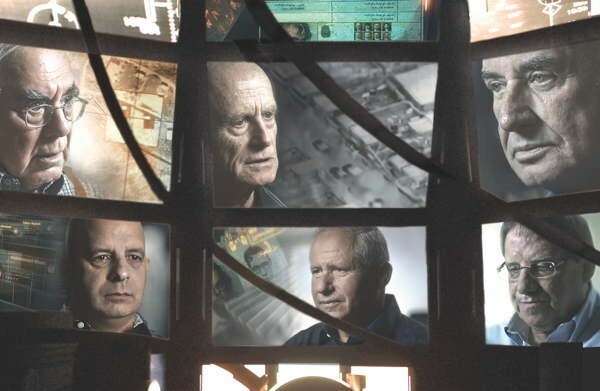 Gatekeepers documents the first ever interviews with former leaders of the Shin Bet, the Israeli intelligence agency. This film was intense and powerful. The leaders discuss their actions and reflect on past decisions made. Scenes of suicide bombers are difficult to watch, and having spent 3 years of my life in Israel, I found some scenes in the movie disturbingly reminiscent of that past. I had heard this film coined as “provocative” and “controversial” and, after watching it, can definitely see how it can appear so – especially to those of us who are far removed from the situation. All I can say is that these men have had to make more difficult decisions than most of us can ever imagine and that alone should be respected. If you want to gain insight into the conflict situation in the Middle East and how Israel has dealt with bringing safety to its people and attempting to diffuse this regional hostility, this is the movie for you! These four documentaries were completely different but I really enjoyed each one. I am a huge fan of documentaries in general and love being able to learn something new. Have you guys seen any of these films? Or do you have any documentaries you can recommend? I am back in Edmonton for the weekend and so happy! 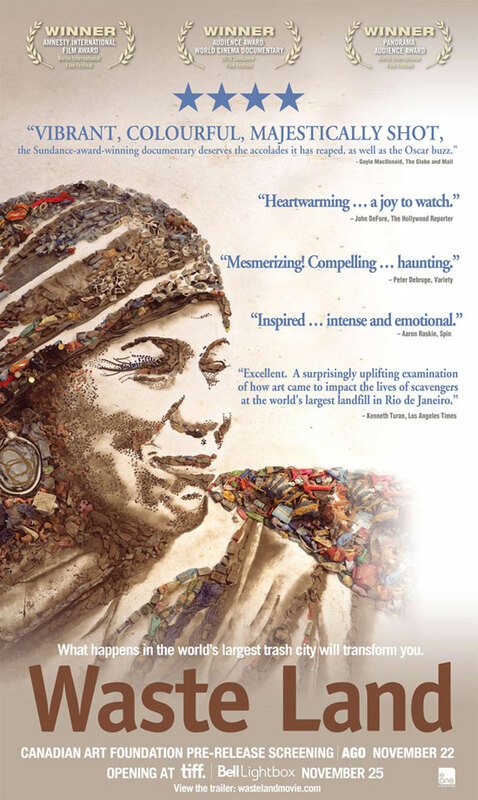 As you guys may already know, the Global Visions film festival is on this weekend in Edmonton! This is Canada’s longest running documentary film festival and I had a chance to volunteer with them in 2012. Sadly, since I am working out of town, volunteering wasn’t really an option this year. However, being back today and Sunday, I am going to make the most of my time and try to squeeze in watching as many documentaries as I can. The line up of films this year looks fantastic and I strongly recommend you guys check them out if you are in the Edmonton area. 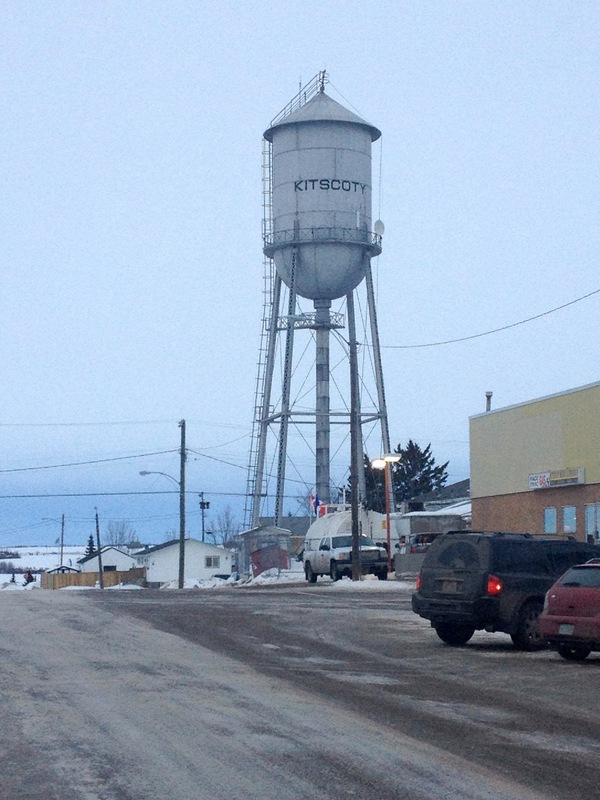 I have to share that I came across a gem in Lloydminster! I was expecting the food options to be fairly limited in a town the size of Lloydminster, especially when it came down to healthy eating. I even made a batch of morning glory muffins to take with me and got all stocked up with organic snacks before I set off for my travels. However, I was so pleasantly surprised to find The Root: Community Emporium in Lloydminster. This restaurant has been open for about a year and, from what I could see, they are doing a fabulous job. 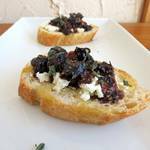 They use local, fresh ingredients and the dishes clearly show that they are prepared with a lot of care. They have both a daily farm and vegetarian feature. The Root also has live music and art displayed on all the walls. I loved this place so much that I came back a second time during my week in Lloyd. The first time I ordered trout with mashed potatoes and a broccoli/zucchini soup. 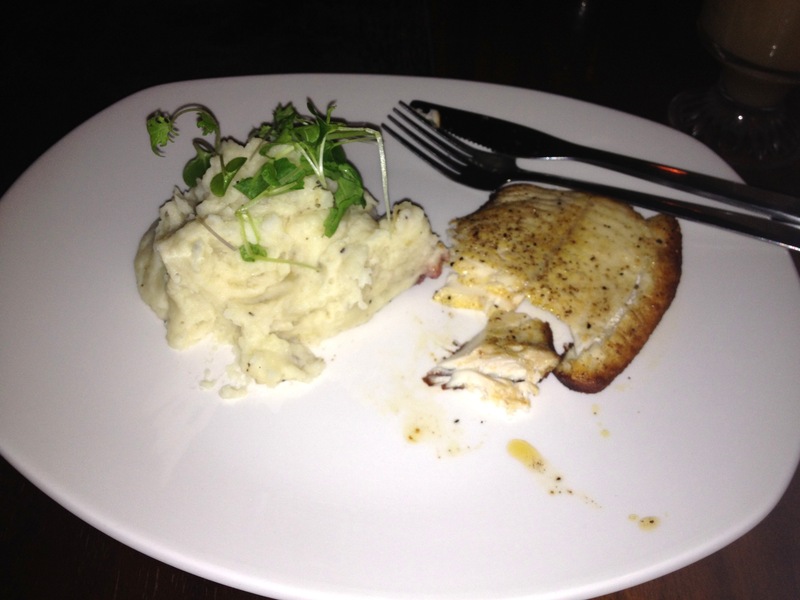 They let me know they were out of trout and had pickerel instead – that was fine with me. If anything, it was a good sign that they order their ingredients fresh and don’t have a huge stock pile of frozen stuff so when it’s out, it’s out! The fish was perfectly cooked and reminded me of the fresh fish we’ve made at home when my dad comes home from fishing trips. 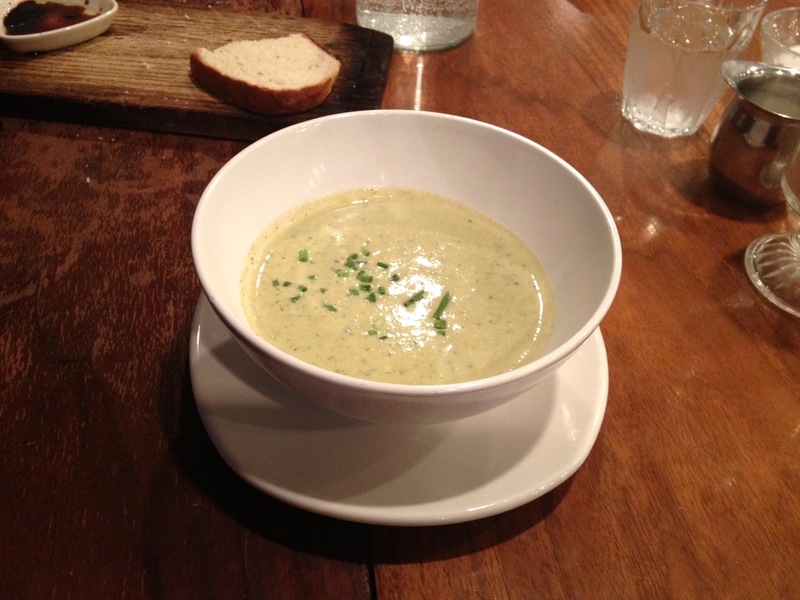 The soup was light and comforting. I love vegetables so the combination of broccoli and zucchini was perfect. 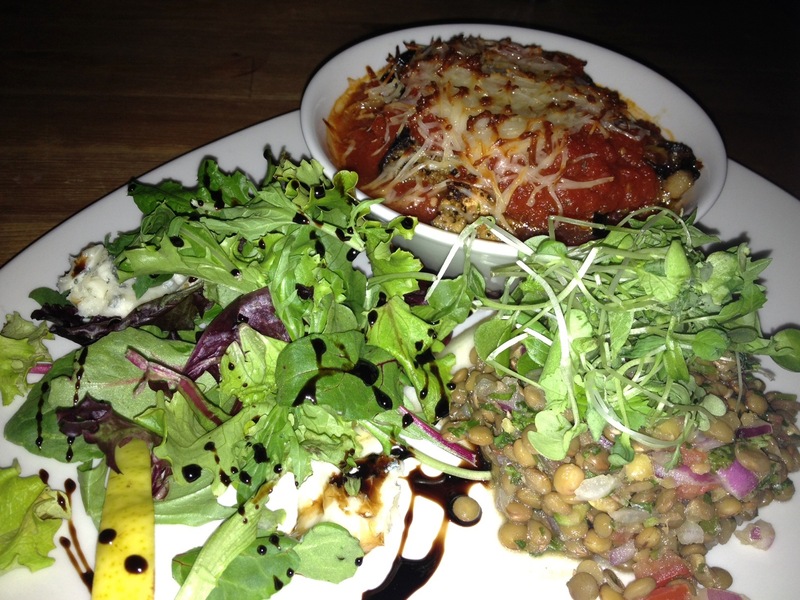 The second time, I ordered the vegetarian feature which was an eggplant parmesan. It came with lentil salad and a pear gorgonzola green salad. This meal was also delicious (although the eggplant was a bit too salty for my taste). 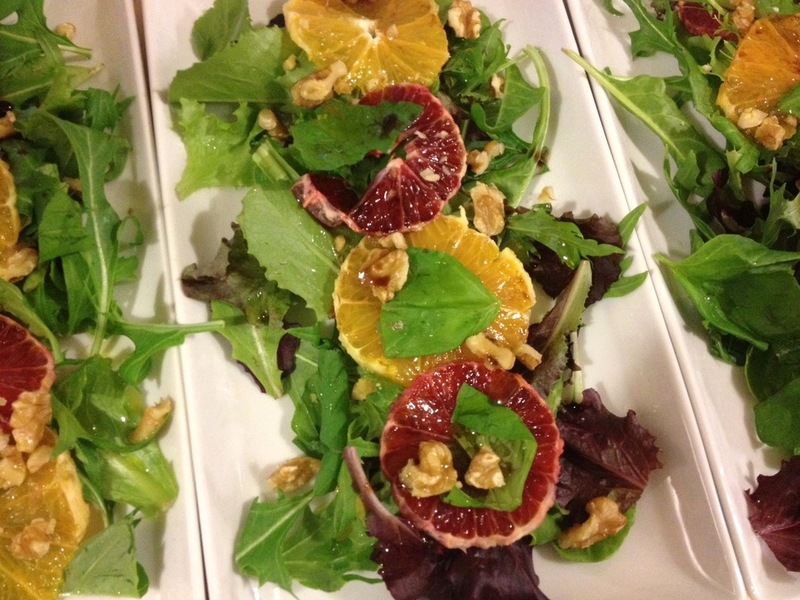 The salads were perfect though. I was especially in love with the lentils. The Root also serves premium loose leaf tea (I believe from Banff Tea Co.) which I found a rarity in Lloydminster. Overall, I would gladly return for another meal (and probably will since I am returning to Lloyd on Monday morning). 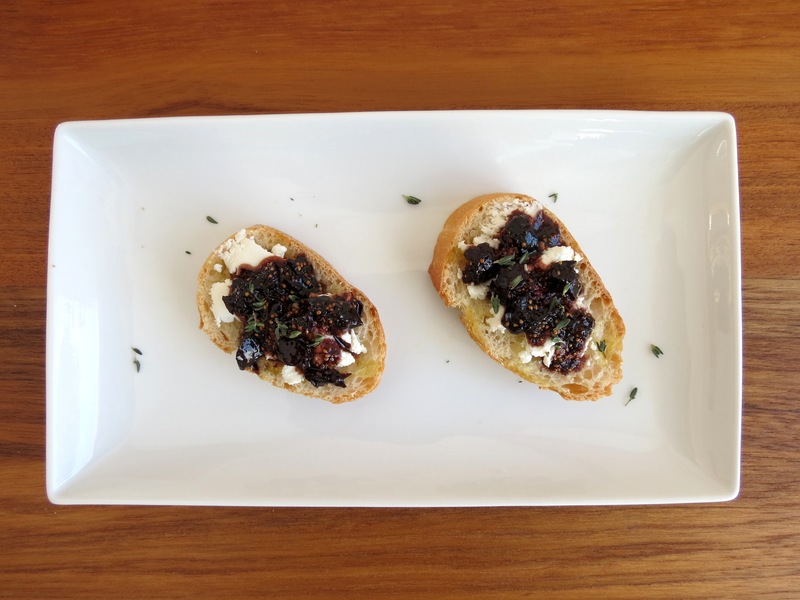 The food was the best I’ve had in the area, the service was friendly and the restaurant was cute and eclectic – definitely a find in Lloydminster! I’ve had several people ask if using a scale really makes a difference. Well, that depends on what you do in your kitchen. If you mainly make recipes where you eyeball how much of each ingredient to add, then having a scale will probably not change your life. However, if you’re planning on pursuing baking further, maybe trying some more complicated recipes, then yes, a kitchen scale is totally worth it! 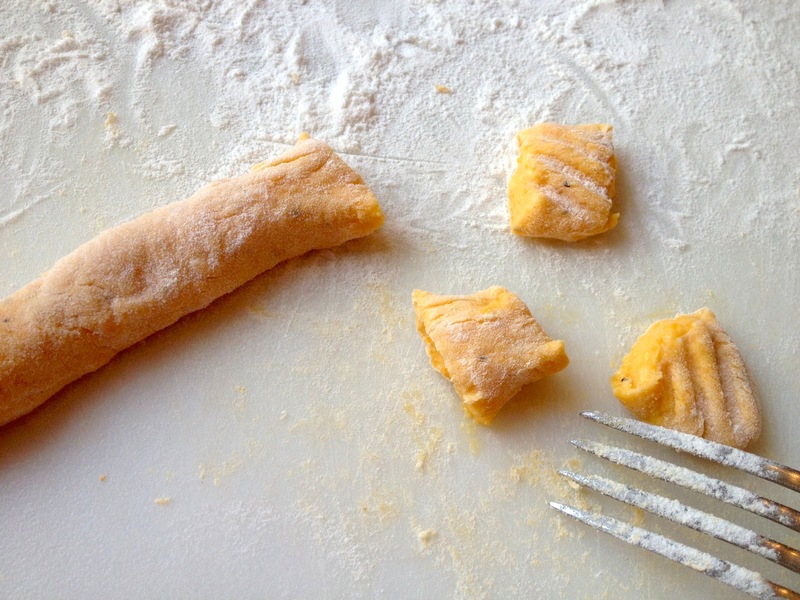 Even for relatively simple recipes, scaling your ingredients will make a huge difference. The same ingredient ie. flour can weigh a significantly different amount depending on the type and how its packed or scooped. 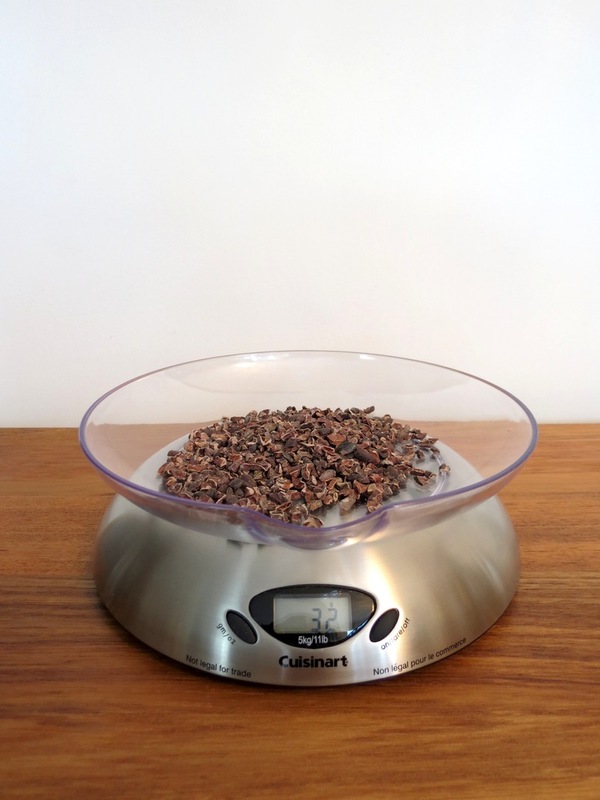 Having the wrong amount can really impact how your final product will turn out and the only way to ensure you have a precise amount in your recipe is to use a kitchen scale. This becomes infinitely more important when making delicate sweets like macarons, eclairs, etc. Plus, using a scale makes clean up in the kitchen way easier since you can measure everything into one bowl and just tare the scale in between. If you’re in the market for a good scale, there are plenty available. I love my Cuisinart one but I’m sure other similar brands are just as good. You can get them at Kitchen stores or department stores and won’t need to spend more than about $40-$50 for a reliable scale – money well spent if you ask me! I’m sure you have heard this a million times, but each oven is different (just like snowflakes)! And nothing is more frustrating than working really hard to make the perfect batter or dough, only to have your product end up burnt. So to avoid all that frustration, I recommend calibrating your oven. A great tip I read on oven calibration was from the Bouchon Bakery book, which recommended buying some ready to bake biscuits, cookies etc. and baking them in your oven exactly as per the package instructions. Those doughs are extensively tested so the baking times should be very precise. I’ve actually been having problems with my oven lately… sometimes it heats up too much and other times it seems like it’s not even on so I decided to do a calibration last weekend. 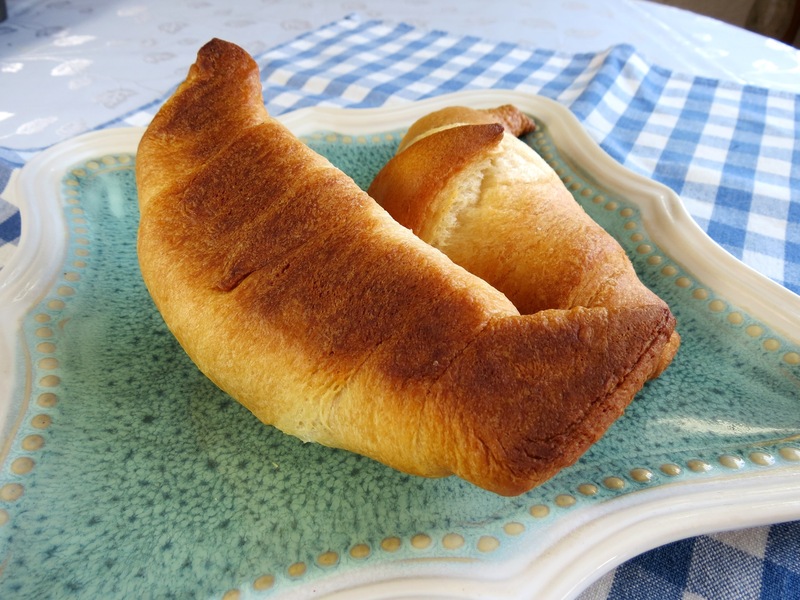 I got some ready to bake croissants, which before I go on, I need to say that they were awful! Who would buy these? They were salty and bitter and whatever fat was used to make them just tasted terrible – avoid buying them other than for calibration purposes. The instructions indicated that they should be ready in 17 minutes. After baking for 17 minutes they were overdone – the picture might not show it that well but the bottoms and corners were borderline burnt. So I know that in general I should set my oven to a bit of a lower temperature or reduce the baking time. Another oven tip from Bouchon was to ensure your oven was fully and evenly heated before baking. This is complete when the oven has cycled on and off three times. If you don’t want to stand by your oven and watch the temperature increasing and decreasing, then turn on the oven and set a timer for about 45 minutes. After 45 minutes, the oven will be fully and evenly heated and will have cycled 3 times. Make sure to do this before calibrating your oven. Just like scaling, measuring temperatures becomes increasingly more important when you start working with more complicated recipes. 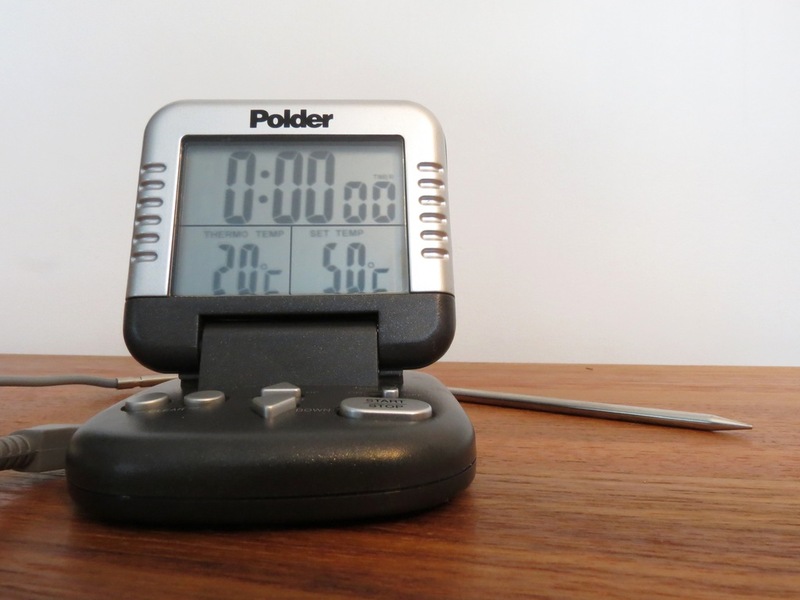 A professional food thermometer is super handy when making macarons, caramel, meringues, etc. I would say that at about $50 this is another great investment you won’t regret making. Plus, you can use food thermometers to ensure your meat is perfectly cooked so I’m sure you’ll get a lot of use out of it. I have heard this term used so much lately – in cooking classes, books, TV, etc. Its a French term which means “everything in place.” When you guys cook or bake does the kitchen ever end up looking like a disaster zone? I have to admit, this happens to me a lot! Well, “mise en place” is supposed to prevent that. It involves being organized before you begin. Read through the recipes carefully before starting off to make sure you are familiar with all the steps and have everything you need. Arrange all your ingredients so they are ready, washed, chopped, etc. When you are done with something, put it away to avoid unnecessary clutter. I definitely need to keep working at this, but its a good goal to strive for. Having an organized kitchen keeps you from making mistakes during baking or making a mess and having to deal with the aftermath. If anyone needs some beer recommendations, check out our friends’ blog! After that we headed over to the Parka Party at Latitude 53 to meet up with some friends and hang out on the outdoor winter patio. It was a great time and I love seeing events in Edmonton which celebrate our winters. 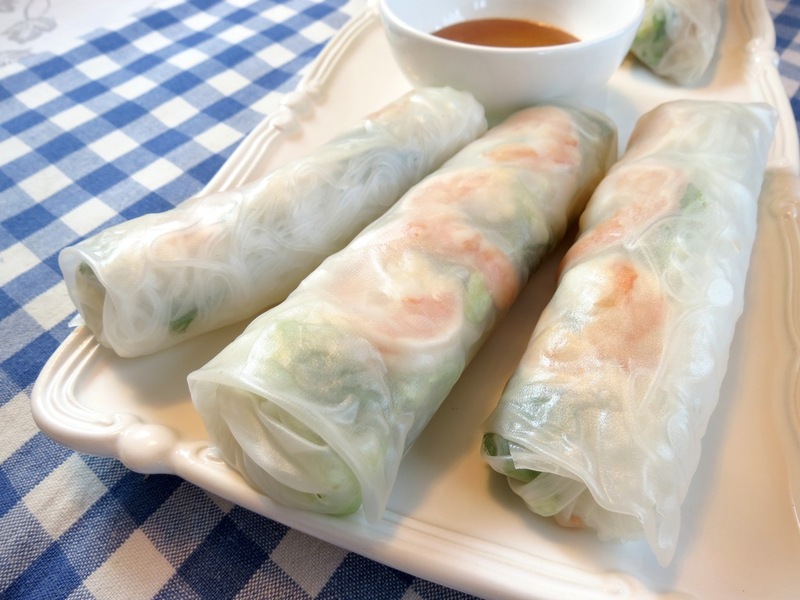 I LOVE salad rolls! 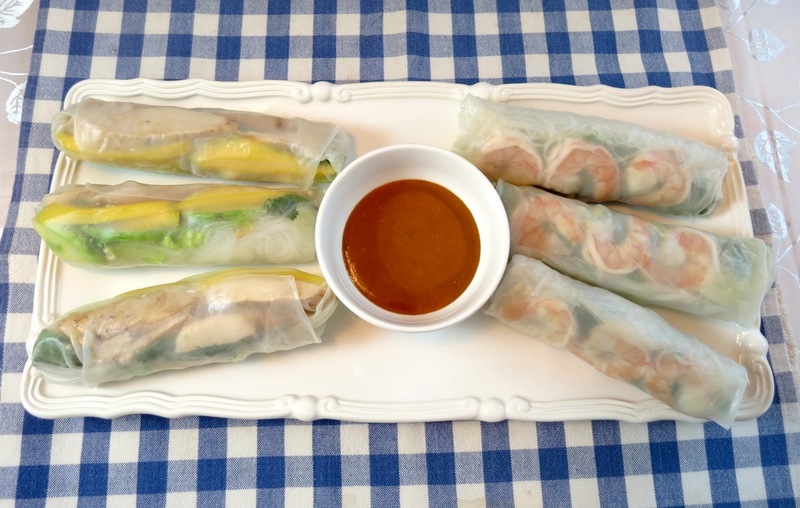 What can be better than all those fresh ingredients, wrapped in soft rice paper and served with peanut sauce? 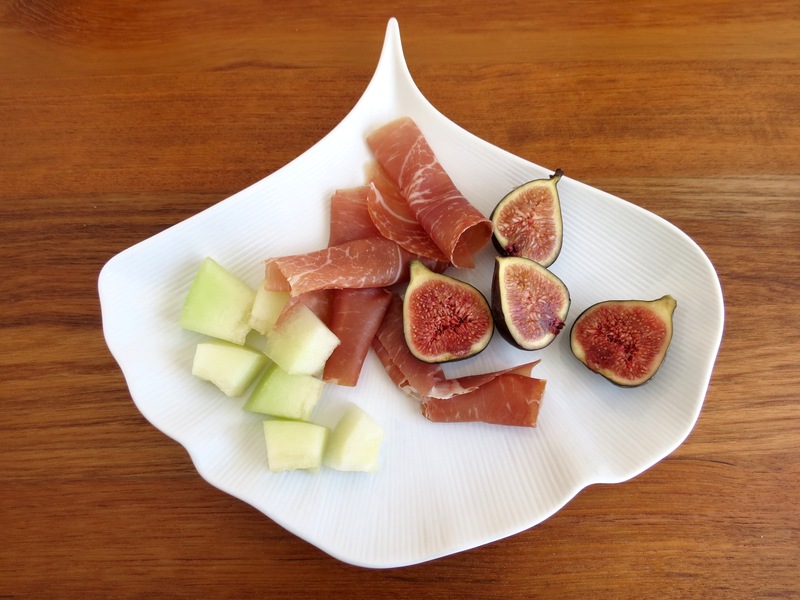 They are so easy to make – the most time consuming part is just cutting up all the fillings. And let me tell you, the homemade ones are just as good, if not better, than restaurant rolls. I made two varieties of rolls. 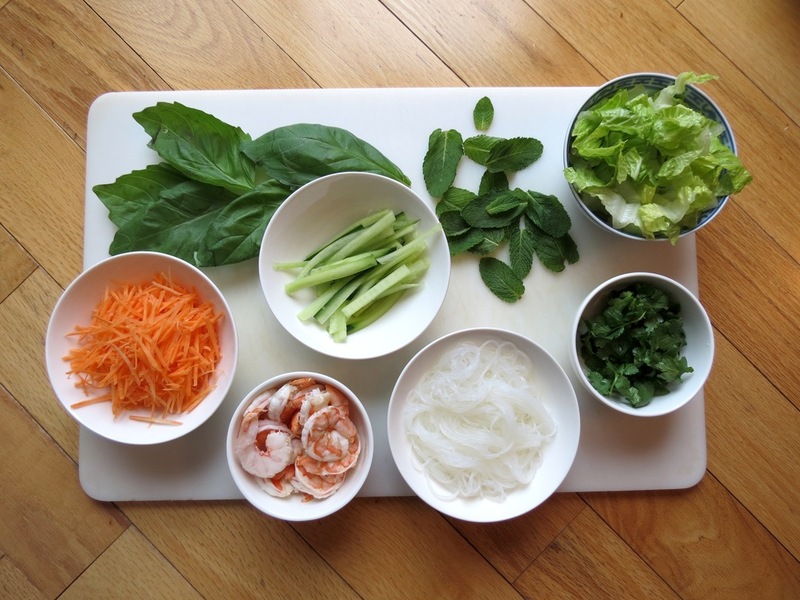 The first was a traditional roll made with: shrimp (cooked by simmering at about 165ºF with lemon, peppercorn, parsley and a bit of salt and sugar), vermicelli noodles, carrots, cucumber, lettuce, basil, cilantro and mint. 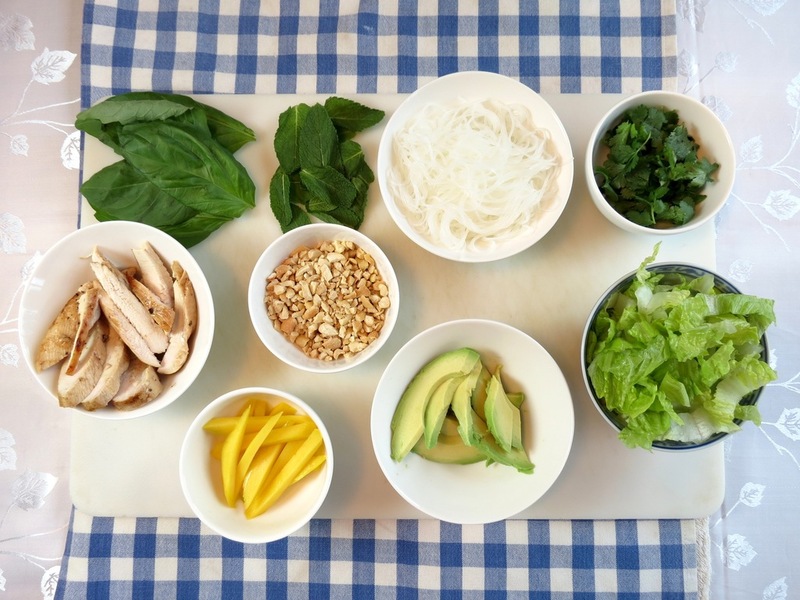 The second roll was filled with: chicken (pan-fried with Asian Five Spice sauce), mango, avacado, vermicelli noodles, lettuce, crushed cashews, basil, mint and cilantro. 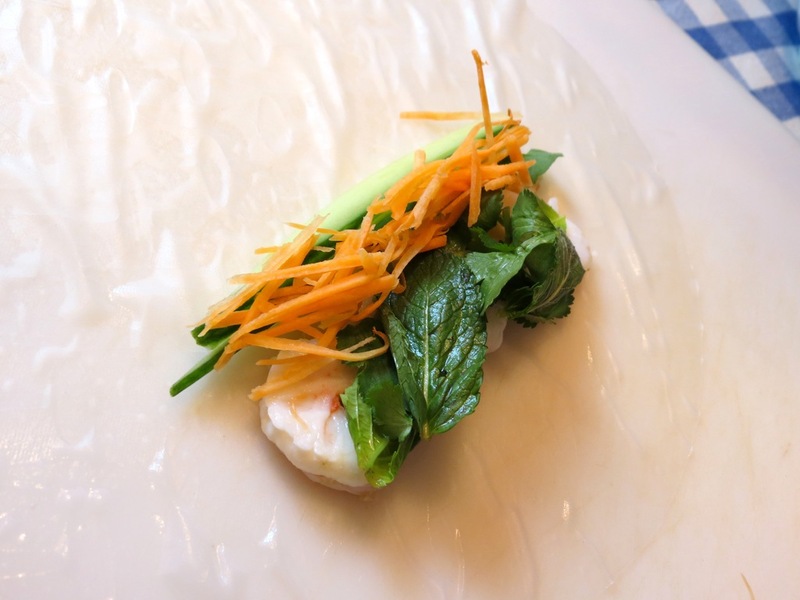 I took the rice paper sheets, one at a time, and submerged them into warm water for a few seconds until they turned malleable. I took them out of the water, carefully wiped them off of excess water and laid them on a flat surface to fill, roll and seal. 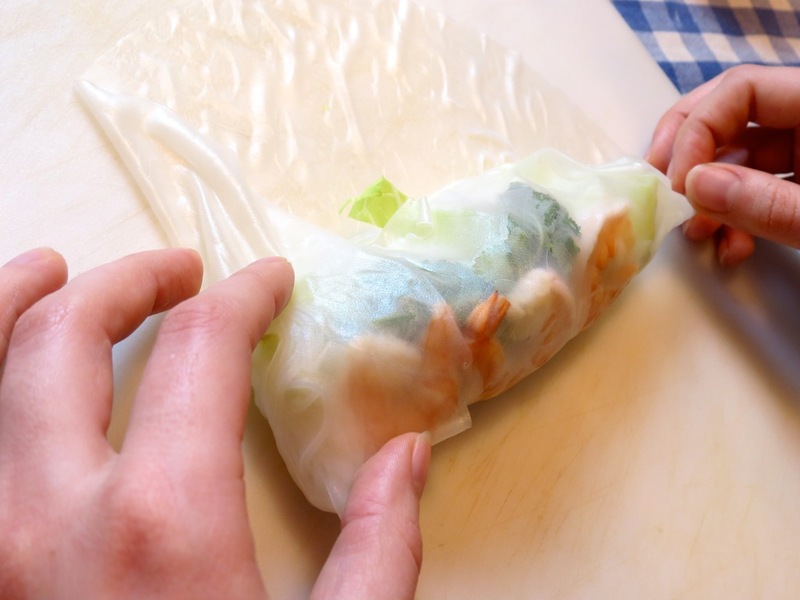 The end result was a bunch of delicious, perfect salad rolls. I served them with peanut sauce we purchased from the Asian supermarket but next time I will try this recipe from Oh She Glows. I’m sure it will be fantastic since it comes highly recommended by my friend, Sarah, who has a great blog on leading a healthy lifestyle. Have a good week, guys!